Late March is the time to examine shrub roses and uncover tea, floribunda and grandiflora roses as temperatures rise above 40 degrees. This keeps fungal diseases from getting a head start. 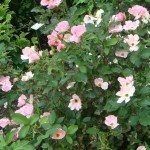 For shrub roses, look for winter-killed canes or rabbit damage. Rabbit damage resembles clean cuts, as if pruned, and roses are one of their favorite winter snacks. Winter-kill resembles dry, dark stems instead of woody or green canes. You can also trim off rose hips that were left for winter interest. First, ask yourself if the rose needs to be pruned. If there is no damage and you like the size and shape, step back and enjoy! If you decide to prune, trim all canes that are dead, diseased or damaged. Have a pair of leather gloves and wear long sleeves to protect from thorns. You may need a friend, if your rose bushes are particularly large. Use sharp, clean pruners and clean with alcohol between plants to limit the spread of disease. Look for fat, red, pointed buds along the living canes. Notice which direction the buds are headed when you cut back a stem. In general, we prefer outward-facing buds so that as new twigs grow, they do not head back into the center of the plant. You may want to thin out a rose bush for better air circulation if it has suffered from fungal problems in the past. For one-time blooming roses, such as some antiques, do not prune drastically in the spring as you will be cutting off flower buds that dwell on the previous year’s growth. On a rose that is several years old, cut down any thick canes that are no longer producing flowers. Go ahead and remove some of the suckers, but leave a few to ensure plant vigor. With a little care in spring, your rose bushes get a great start for the season.